Located on the southern shores of Georgian Bay, Collingwood, Ontario, is a destination appealing to those who value the unique with breathtaking surroundings and tourist attractions galore. Blue Mountain, the headland of the Niagara Escarpment, is a short 10 minute drive from Collingwood and at its base you will find the world renown Blue Mountain Village with everything one would expect to surround a world class resort: fine/casual dining, unique shops, five-star hotels, chalets and condominiums. Home to the Ship Yards and just 130 k.m. outside of Toronto, Collingwood encompasses a plethora of upscale shops, savvy restaurants and cafés, a large golf community, horseback riding, sailing, windsurfing, boating and much, much more! Expect a delightfully social lifestyle where uniting extraordinary homes with extraordinary lives is a way of life. With a population of 19,500 and growing, this inviting town provides a unique heritage, strong local community spirit, and grandeur collection of intriguing Victorian homes. Only a short distance drive to the ever so popular Wasaga Beach, which is the longest fresh water beach in the world, Collingwood is the perfect place to settle. With a collection of upscale shops, divine restaurants and cafés, all within easy reach, this area encompasses unrivaled access to a variety of recreational activities, picturesque views and a collection of some of the most intriguing homes to appeal to those who are looking for a place to call their own. Between Meaford and Collingwood, there are over 7,500 acres of apple trees, more than half located in and around the tiny towns of Thornbury and Clarksburg. For well over 150 years, apple orchards have flourished in the heavy clay and rich loam of the area, stretching from Collingwood to Owen Sound. Surrounded by rich agricultural land and strong farming communities, Collingwood is an inviting tourist destination and town that embodies active living and community spirit. Not only is Collingwood situated in close proximity to apple country, the area boasts a number of quality, upscale golf courses. The Georgian Triangle/Collingwood region is home to a number of public championship courses, upscale private layouts and, outstanding golf resorts. Within an hour’s driving time from Collingwood, there are at least 18 quality golf courses! Located in the heart of Ontario’s finest four-season destination area, Collingwood is easy to reach and offers an amalgamation of heritage and history with an old time enduring charm sure to make any person feel at home. Collingwood: where you can ‘live, work and play’! Today, Collingwood’s industrial base, which includes Collingwood Ethanol L.P., Pilkington Glass of Canada, Goodall Rubber Company – Canada ULC, and VOAC Inc, and which are among the community’s largest employers, has begun to erode. Several industries in the area have closed in recent years, including Nacan Products (2004), Backyard Products (2004), Kaufman of Collingwood (2006), Goodyear Tires (2007), Alcoa Wheel products (2008) and the internationally-famous Blue Mountain Pottery (2004). Collingwood does however have a growing knowledge-based economy, and ishome to five engineering firms, one of which is CF Crozier and Associates,who is currently working on the Shipyards Project. Collingwood is also home to the distillery where Canadian Mist Whiskey is produced. Collingwood has focused on establishing itself as a four-season tourist area. 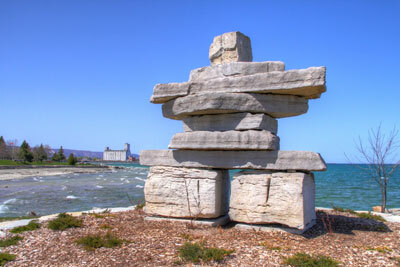 Located on the southern shores of Georgian Bay and located in proximity to Blue Mountain, a promontory of the Niagara Escarpment, the town has become the major recreation area for the southern part of the province. Blue Mountain itself is noted for skiing, and also for its Scenic Caves. The town is also a short distance from the popular Wasaga Beach Provincial Park, an attractive destination that received the title of Biosphere Reserve in 2004. Since 1981, Collingwood has been home to the Thomson Tennis School,an elite tennis training academy operated by Richard Thomson (former Davis Cup captain and coach) and his son Michael. Blue Mountain Ski Resort’s association with international resort developer Intrawest Corporation began in 1986. In 1999 Intrawest purchased 50% ownership of the resort from the family of late Blue Mountain founder Jozo Weider. Together, Intrawest and the Weider family have accelerated development at the mountain, and the cultural and economic focus of Collingwood has increasingly shifted towards providing services for the resort trade. The Barrie-Collingwood Railway (BCRY) is a short-line railway operation involving a partnership between the City of Barrie, the Town of Collingwood, current shippers, CP Rail and the railway operator Cando Contracting Ltd. The BCRY mandate is to provide rail service to all industries in and around Barrie and Collingwood. Local media include the Collingwood Enterprise-Bulletin and Collingwood-Wasaga Connection community newspapers, and radio station CKCB-FM. The Barrie-based regional television station CKVR-TV, an A station, maintains a bureau in Collingwood, and the Owen Sound-based Bayshore Broadcasting radio group maintains an office in Collingwood. Collingwood is also known for its annual week-end Elvis Presley festival, which attracts Elvis impersonators from the world over in late July of each year. 2009 marks the fifteenth anniversary of the Elvis Festival. Collingwood was incorporated as a town in 1858, nine years before Confederationand was named after Admiral Lord Cuthbert Collingwood,Lord Nelson’s second in command at the Battle of Trafalgar, who assumed command of the British fleet after Nelson’s death. The land in the area was originally inhabited by the Iroquoian Petun nation, which built astring of villages in the vicinity of the nearby Niagara Escarpment.They were driven from the region by the Iroquois in 1650. European settlers and freed Black slaves, arrived in the area in the 1840s, bringing with them their religion and culture. The area originally had several other names associated with it, including Hurontario (because it lies at the end of Hurontario Street which runs from Lake Huron— of which Georgian Bay is a part — south to Lake Ontario), Nottawa, and Hens-and-Chickens Harbour, because of one large and four small islands in the bay. In 1855, the Ontario, Simcoe & Huron (later called The Northern) railway came into Collingwood, and the harbour became the shipment point for goods destined for the upper Great Lakes ports of Chicago and Port Arthur-Ft. William (now Thunder Bay). Shipping produced a need for ship repairs, so it was not long before an organized ship building business was created. On May 24, 1883, the Collingwood Shipyards, formerly known as Collingwood Dry Dock Shipbuilding and Foundry Company Limited, opened with a special ceremony. On September 12,1901, the Huronic was launched in Collingwood, the first steel-hulled ship launched in Canada. The shipyards produced Lakers and during World War II contributed to the production of Corvettes for the Royal Canadian Navy. Shipbuilding was one of the principal industries in the town, employing as much as 10% of the total labour force. Overseas competition and over capacity in shipbuilding in Canada led to the demise of shipbuilding in Collingwood in September 1986. The creation of government incentive programs and a fully serviced industrial park made it possible for Collingwood to attract eleven new manufacturing firms to the town by 1971. Eight additional manufacturing companies had located in the town by 1983, making Collingwood the largest industrial employer in the region.